Short and sweet, gang. I’ve been craving an apple cider donut for like a week now but have neither the stomach for deep frying nor a donut mold for my oven. So I went on a hunt for a cake that would give me the same experience. The world’s most perfectest apple cider cake is here. It really is like a ginormous apple cider donut. 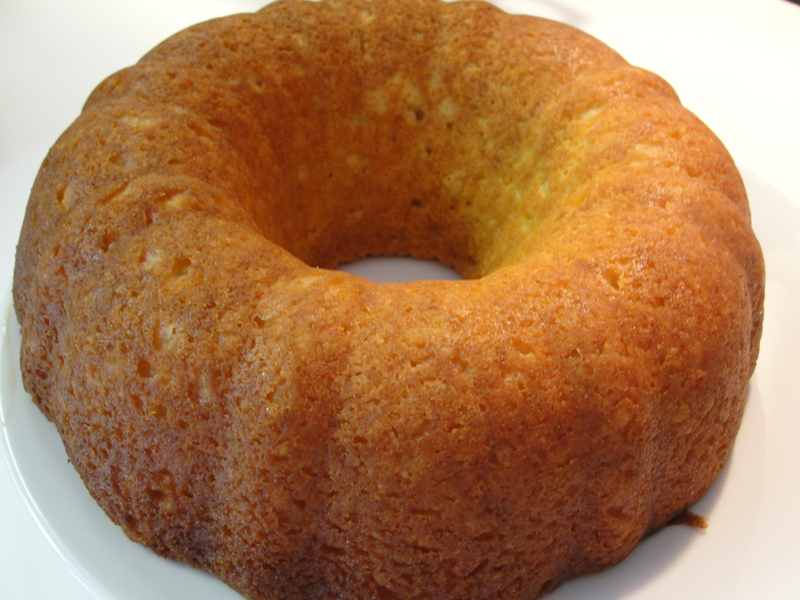 And it only has about six ingredients, one of which is plain old yellow cake mix. My only tip here is to be liberal in your pan-greasing. I used a baking spray with flour in it. But you’ll want to use regular baking spray and then coat with flour if you don’t have this. Much stickage potential. As you see, mine didn’t. Careful greasing is key. Boo-ya, working moms. You will be a rock star. Promise. Go. Go now. Make this. Enjoy. Happy weekend. Until last night, I’d never made Penne Alla Vodka. Two good reasons: ten thousand steps and ingredients, and heavy cream. Who cooks with heavy cream? Christmas Eve, yes. Wedding, yes. Even birthday. Fine. But for a regular old Tuesday? I think not. Then, I learned a secret. In almost every recipe that doesn’t involve actually whipping the cream, evaporated skim milk makes a darn tasty substitute. Open a can, and voila. Calories are slashed. Fat is slashed. Recipes that hereunto made you shudder in your skinny jeans are suddenly realistic, even for a regular old Tuesday. You get the same yummy creaminess without the dietary disaster. This was a Giada recipe I doctored up a bit. Evaporated skim milk for the heavy cream, with a little more than she called for because I like this a little creamier. Jarred pasta sauce for her homemade tomato (which is delicious and great and freezable, but I didn’t have the time to make it or the forethought to have made it previously and frozen it). I used shredded Parmesan in this. You should not. You’ll notice the photo above is not mine. That’s because shredded Parmesan doesn’t melt down and my sauce was a bit more…um…textured than I’d have liked. Ugly. Tasty, but ugly. So save your plates and use the grated kind. Even out of the green can. It’ll work in this. Sprinkle some shredded on top when it’s plated if you want. I used the full cup of vodka called for in the recipe, and you could definitely taste it. Cook it down. When you think it’s ready, let it go awhile longer. Cooking it down will get rid of most of that alcohol bite. I liked it, but I can see where it would be too much for some people. In fact, you might consider using 1/2 cup your first time out with this. See what you think. You can always go up on it next time. I learned making this that vodka boils quite violently. Keep a watchful eye on your pot and your burner temperature. You really want a simmer. And taste it before you add the milk so you don’t wind up with a table full of loopy people after dinner. The recipe I started with said this would yield 6 servings, and that’s pretty accurate. 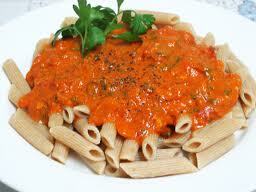 You don’t need to drown your penne with the sauce–there’s lots of flavor in it. In a heavy pot over medium heat, stir together the sauce and vodka. Simmer, uncovered, adjusting burner as necessary, for about 30 – 45 minutes, stirring every 10 minutes or so, until it reduces by about 1/5 and the alcohol taste is gone. Stir in the milk and heat through. Stir in cheese and heat until it’s melted and combined into the sauce. Pour over cooked noodles, garnish, and enjoy. I was headed up to bed last night when my slow cooker called to me. Sitting there on the counter, it was all shiny and clean from Sunday’s taco night, and it wanted to make breakfast. 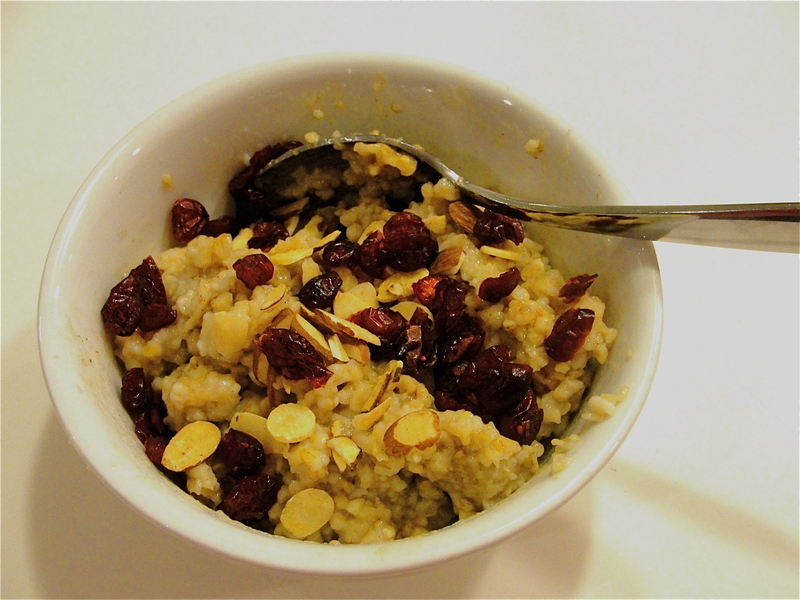 I’ve made steel-cut oats in the slow cooker before; it’s simple and easy. But they don’t tend to keep much of their signature crunch cooked this way. A reader wrote and asked me if I had a solution for that, and I thought about it a lot over a week or two. Last night was the experiment. It worked pretty well. And it was really simple–just reduce the water from what’s called for on the oatmeal box or can. Makes sense, right? You reduce the water when converting a recipe from oven to slow cooker, so why not do it with a stovetop recipe as well? This wasn’t as crunchy as making it on the stove, but it took less than five minutes as opposed to 20 or more, and was ready when I got up in the morning. I turned my cooker off, cracked the lid a bit, and let it sit for an hour or so before breakfast; I’m not a big first-thing breakfast eater. It was warm and lovely with a little brown sugar, a dash or two of pumpkin pie spice, some Crasins, some sliced almonds, and a little milk. It’s been three hours and I’m not the least bit hungry yet, so that’s another victory. Season yours as you’d like. I’d cook it plain and then season and add ingredients when it’s finished. This makes a crust around the edges of the pot. Just stir that in when you wake up. It’ll soften and blend in as it sits. You can also make a big pot of this and store it in the fridge. It microwaves really well, especially if you stir in a little milk first. 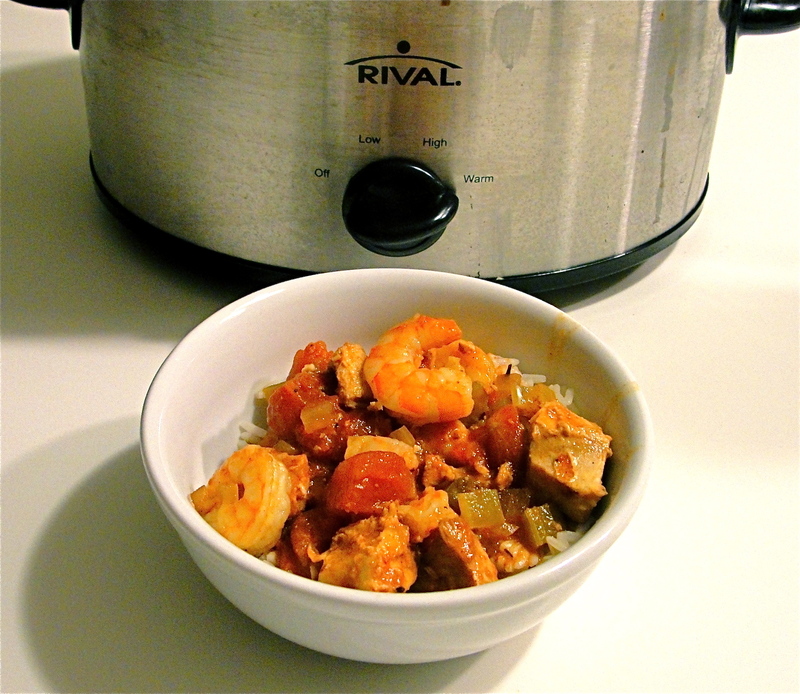 Coat your slow cooker with cooking spray. Add the oats and water. Give it a quick stir, set it on low, and go to bed. In the morning, turn the cooker off, stir in the crusty bits from the edges, crack the lid a bit, and go take your shower. Stir in your add-ins and enjoy when you’re ready (I used a teaspoon of brown sugar, a sprinkle of pumpkin pie spice, about a teaspoon each of Craisins and sliced almonds, and a half-cup of milk on mine). I hear my New Orleans friends cringing and I’m sure this isn’t exactly authentic, but it’s really good. It’s simple and easy and my kids like it (bonus!) and comforting and warm. It’s also a dice-and-dump recipe. My favorite kind of recipe for the slow cooker. The original version of this recipe had you cook the rice in the same cooker as the sauce. Which is fabulous if you’re eating it all at once. For leftovers…not so much. Mushy second-day food, and we’ve already established that I don’t do mush. So I fiddled with it. I reduced the overall liquid in this, cooked the rice on the stove, and served the rice/chicken mixture over the rice. Awesome, and it keeps really well for a second or third day. Frozen shrimp is great in this. I always have a few pounds in the freezer, and it’s super simple to pull it out and dump it in. Just don’t do it until an hour or so before you’re going to eat, or they’ll curl up into nothing. And feel free to leave the green peppers out if you don’t like them. No worries. Spray your slow cooker with nonstick spray. Dump in everything but the shrimp, peppers, and rice. Stir well. Cook on low 6-8 hours. An hour before dinner, stir in the shrimp and peppers. Serve over rice. There’s no ice in this here smoothie. I don’t know why people put ice in their fruit smoothies. I like mine thick and creamy and milkshake-y, and ice just waters things down and adds crunch to the mix. There’s no crunch in smoothie, at least in my house. Getting thick without ice requires one simple thing. Frozen fruit. If you start with frozen fruit, you don’t need ice, see? And you get that wonderful milkshake thickness in a meal or snack that’s chock full of vitamins and nutrition. I always start with nonfat vanilla yogurt and half a sliced, frozen banana. That’ll guarantee creamy–bananas are nothing if not the perfect thickener for fruit-based drinks. The vanilla yogurt adds sweetness and a hint of extra deliciousness. And beyond that, the sky’s the limit. Strawberry-banana. Blueberry-banana. Chocolate banana (MMMMMMM!! Use a whole banana, a spoon of cocoa powder, and a little extra sugar). Nutella-banana. Peanut butter-banana. I could go on for hours. 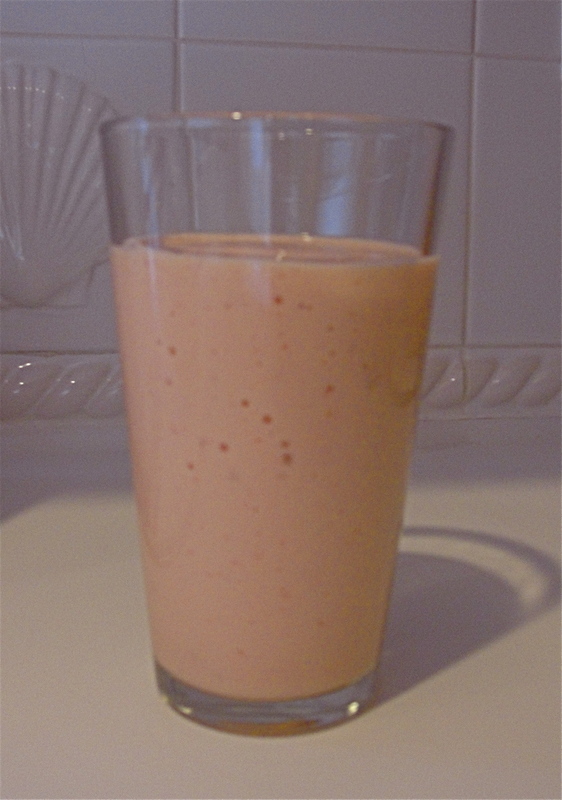 The smoothie you see above was made with a scoop of Dole Tropical Fruit Mix that I found in the freezer of my third-world supermarket. Assuming your market is the least bit civilized, you’ll find this along with the bags of frozen strawberries, raspberries, blueberries, and other fruits. Pick your favorite and you’ll be in business. I like the tropical because it’s sweet and my kids think it’s akin to soft ice cream when it’s whirled together. But anything you like is just fine. Don’t be afraid to give your blender time to really destroy the fruit. Remember–no ice. No water. You can let ‘er rip until the job’s done and you’ll still get creamy and thick. If you hear bits of fruit whacking against the blades, let it go until the machine reaches a steady, even hum. And feel free to add powdered fiber, flax, or other supplements to these. You won’t notice. I had mine for breakfast today, but it’s a perfect mid-day pick-me-up or after school snack. Even a dessert, depending how sweet yours is. Hope you like it! A heaping 1/2 cup of another fruit or fruit blend, also frozen. Pour the yogurt into your blender. Add sweetener, frozen fruit, and milk. Blend on the highest setting until you don’t hear any chunks smacking into the works. Pour and enjoy. Makes 1 meal-sized (the glass in the photo holds 20 oz) or 2 snack-sized smoothies. You know those really yummy butter cookies that come in the fancy-schmancy tins at the grocery store? Ditch the tins. 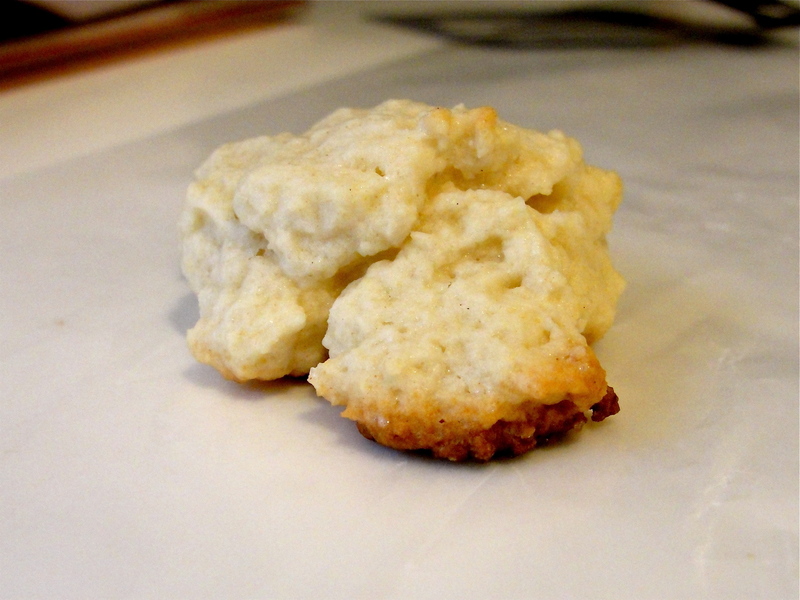 You can make amazing, melt-in-your-mouth butter cookies at home. Ten minutes, tops, to make the dough, and 10 minutes in the oven per dozen. And you will not believe how good they are. This is a Mark Bittman recipe. Mark Bittman is the man as far as I’m concerned, and if you don’t have a copy of his How To Cook Everything, you need to race right out and get one. Because if it’s not in there, you probably don’t need to make it. I fiddled with it, just a touch. I used half bread flour, just because I wanted my cookies a little chewier. A little more bite. But you can use all AP flour and they’ll be amazing too. You’re going to want to bake these on a cookie sheet that’s lined with parchment paper, and you’re going to want to spray the business side of that paper with butter cooking spray. That’ll help these brown and get all golden delicious on their bottoms. And as soon as you see a little golden delicious underneath, on the bottom edges, pull these out and cool them. Trust me–you’ll get soft and slightly chewy and mmm mmm good. 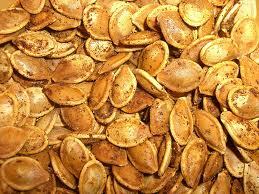 These keep for several days in an airtight container. They’ve never lasted that long around here, but in theory, that’s true. Heat your oven to 375 degrees. Line a heavy cookie sheet with parchment paper and spray that with butter spray. In a bowl, gently stir together flour, baking powder, and salt. In your mixer bowl, cream together butter and sugar until light and fluffy. Blend in vanilla and egg. Mix well. Gently–oh so gently–stir in half of the flour mixture. Do not overmix this–you’ll toughen up these sweet cookies. As soon as the flour is mixed in, mix in the milk, and then the rest of the flour. Drop by rounded teaspoons onto the cookie sheet–these don’t spread much so you don’t need a lot of room. Bake 10 minutes or until the bottoms start to brown. Cool on baking sheet for 2 minutes, and then off the baking sheet until room temperature. Store in a sealed container.